Made by Functional Products Pty Ltd in St Peters, New South Wales, Australia, 1953. Armchair with wooden frame and body of fawn woven cotton webbing. The basic frame is v shaped with three cross supports. The seat and back have a convex form and the legs are splayed, with the back legs extending into arm rests. The cotton webbing is pulled taught over the frame and held in place with tacks. Joints are dowelled and screwed. Label: "Registered Design/ form/function/structure/Douglas B Snelling associates/Designers Sydney/Manufactured by Functional Products Pty Ltd". Chair is stamped with date of manufacture " 474 24 Feb 1953"
Designed by Sydney architect Douglas Snelling (1916-1985) and made by Functional Products Pty Ltd, St Peters, Sydney. 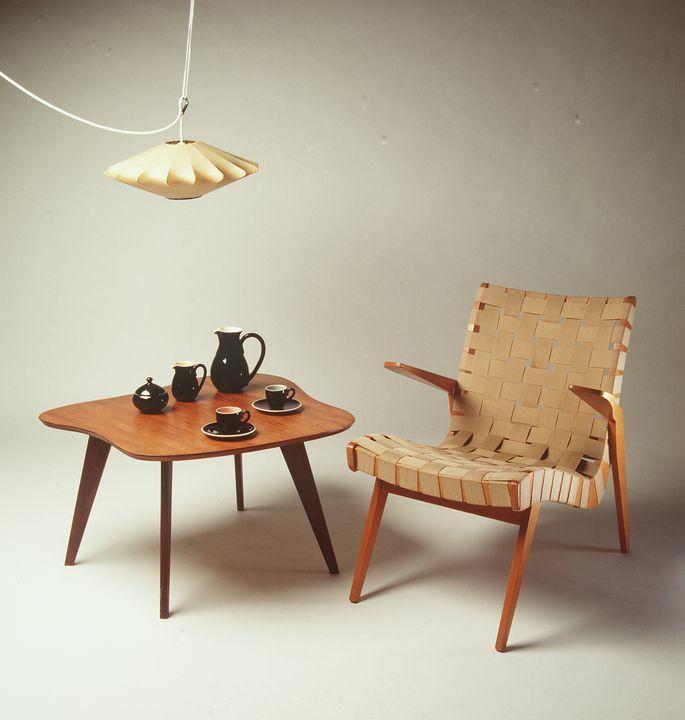 Parachute webbing chairs became the signature item of furniture developed by Douglas Snelling after World War II. The 'Snelling Line' was Australia's first popular, mass produced range of furniture sold widely through the major department stores from the late 1940s to the mid 1950s. Featuring clear finished Australian timbers and brightly coloured webbing, the range quickly became popular in stylish interiors and was often featured in journals such as House and Garden and the Australian Home Beautiful. The line included armchairs, rocking chairs and dining chairs as well as coffee tables, dining tables and cabinets. The 'Snelling Line' was advertised as 'Contemporary Furniture designed by Douglas B Snelling from his experiences in Southern California'. Snelling worked as a designer in America during the war and had seen the latest in American design. His furniture was strongly influenced by the Scandinavian style of Aalto and Mathsson. The post war years saw a change in housing style in Australia to open plan living areas and lower ceilings. Traditional dark wood and heavily upholstered furniture did not suit these spaces and the clean lines, light weight and uncluttered look of the 'Snelling Line' was particularly suited to the new 'modern' home, where it found a ready market. Douglas Snelling formerly qualified as an architect in 1950 and in a few years he ceased working for Functional Products to concentrate on his busy architectural practice. The 'Snelling Line' gradually declined in sales especially as oiled teak furniture came into vogue in the late 1950s. Functional Products Pty Ltd was formed in 1947 and was managed and majority-owned by Terry Palmerston. The other owners were Douglas Snelling, Douglas Davidson and Robert Shaw. Snelling designed the Functional Products factory that was built in St Peters, Sydney, in 1947. Snelling, Davidson and Shaw left F.P in the mid-1950s when it became a public company. Palmerston eventually sold the business in 1986. Sold to donor by Artes in 1953.